In this post we would like to show one way of how to use comparison tools in BittsAnalytics. In periods of sideways movement in prices or downturns, the relative outperformance or underperformance of one cryptocurrency in comparison to another becomes much more important. Any tools or data that can help you with relative selections provide potential added value. As an example we chose the comparison between two of the biggest cryptocurrencies, Bitcoin and Ethereum. The data we are interested in are daily tweets mentions of both as well as sentiment calculated with machine learning from tweets about them. As you can see in the chart below, Ethereum has opened a gap in sentiment on 9th January and maintained it since then. Since that time Ethereum has outperformed Bitcoin by around 40 percentage points. 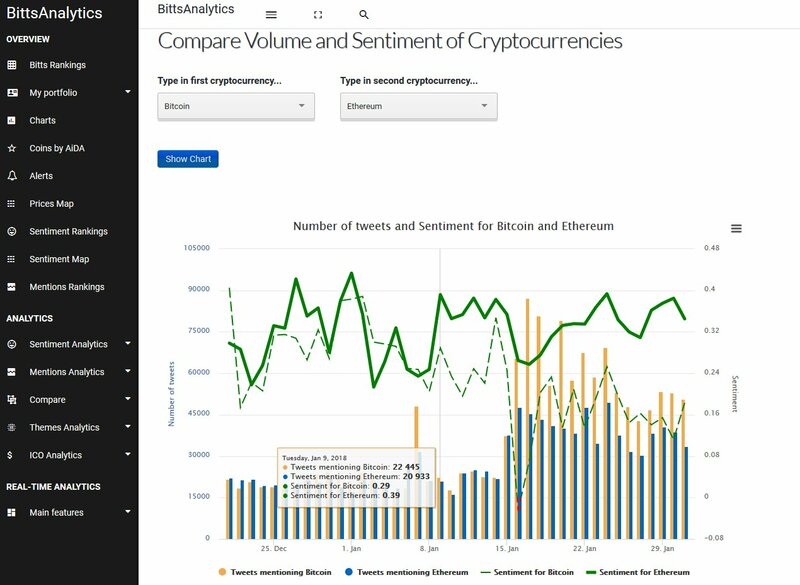 Note that Bitcoin substantially increased the lead in tweets mentions but still lagged behind in price. So the buzz itself is not necessarily indicative of the price direction, the sentiment of buzz seems to matter though.